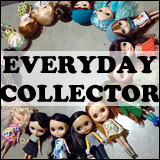 BlytheLife.com » Interview with Andreja of Katjuss & Giveaway! The first person I’m featuring as part of the March Talent Showcase is Andreja! Her attention to detail is phenomenal, as I think you will agree, and she sells under the name Katjuss on Etsy. Her miniatures are amazing and her sewing is awesome! Continue reading to learn more about Andreja, her clothing and her miniature work. Hello Andreja! Please tell us a little bit about yourself. Hi Michelle and Blythe Life readers! I live in Ljubljana the capital of Slovenia, a tiny European country, shaped like chicken. If you look eastern of Italy and south of Austria, you’ll find us there. I’m graphic designer by profession, I was working 18 years in advertising agency but for a year now, I work as freelance designer. It enables me to spend more time with my family and of course for my hobbies. I’ve been a crafty person since my childhood – I remember I was always making all sorts of things for my dolls, rather than playing with them. I missed that when I grew up. Although I work in a creative profession and love my job, It’s still mostly work on computer. So working with hands like knitting has always been kind of stress relief for me. As a knitter yourself you probably know what I’m talking about. I entered the doll hobby in 2012 with Fashion Royalty dolls (Integrity Toys). Soon after buying my first doll, I joined Flickr. I discovered so many talented people there – I could spend hours and hours browsing their pictures! There’s where those quirky cute big head girls caught my eye. At the beginning I didn’t even know the difference between Blythe and Pullip and Icy. It turned out that the dolls I liked the most were actually customized Blythes, but they were far above my budget. I opted for a more affordable doll and bought my first Pullip. 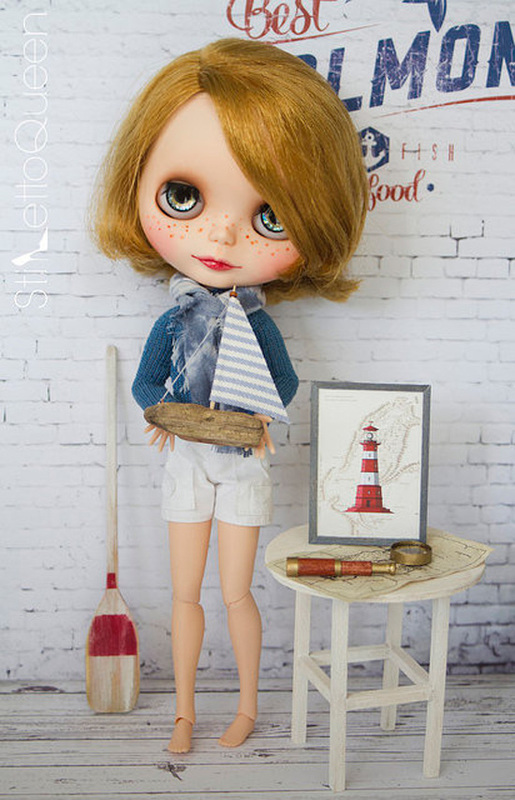 After some minimal alternations (like wig and body changing) I felt confident enough to buy and customize my first Blythe. But I realized soon there’s a huge difference between opening and reassembling Blythe or Pullip doll. I couldn’t even open her head without some help from my husband. And despite being familiar with brushes and pencils, the doll head is not an easy object to draw on, but I enjoyed the whole process and I love her despite all imperfections. Who is in your doll family right now? My doll family is small but pretty diverse. Flora is my first (and so far the only) Takara Blythe (Nicky Lad). I bought a fake one with beautiful mint hair to practise my customizing skills but she remains in her original condition (being to busy modeling for my Etsy shop). I have two Pullips – Alte (named Lucie) and the newest addition Merl (which I haven’t named yet). And then there are my Fashion Royalty ladies – eight of them in total. 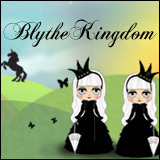 Tell us about what you do in the Blythe community? The one thing I like the most about this hobby is the broadness of creative challenges – from customizing to sewing and knitting, making miniatures and building dioramas. I’m always searching for inspiration and whenever I see a new craft or technique I want to try it out. I realized I make more things than my dolls need and It would be nice to share them with doll community across the globe. In August 2015, I opened my Etsy shop which offers doll clothes as well as some 1:6 scale miniatures. What was one of the first articles of doll clothing that you created? What were some challenges you faced with sewing so small? The first doll item (if not counting those I made as a child) was a knitted wool sweater. I made it exactly the same way as I would make a human size sweater – back and front part and two sleeves – all flat pieces that had to be sewn together. It was a nightmare to finish it, especially the sleeves. After some trials and errors I worked out a pattern that has only one seam at the back and fits dolls nicely. When it comes to sewing – as a self taught seamstress – my work is not factory perfect, but I put a lot of care and effort to make things neat and cute. I carefully chose the right fabrics, (I don’t want the clothes to look bulky) and I like when it drapes realistic – like human clothes. Another challenge is to find the sewing notions in right proportion. I always look for the tiniest buttons and snaps, yet some of materials are not available where I live (like silk ribbons). I buy some of supplies online, preferably on Etsy. What was the first item you sold in your Etsy shop? What was that experience like? It was a dusty pink dress with knitted top and rose print skirt. I was so excited! It’s a nice feeling when someone likes something you’ve made enough to purchase it and add it to his/her collection. I waited 12 days from the opening of my shop till the first sale and it seemed like ages. I realized later it wasn’t that long at all and many sellers waits weeks and months till they make their first sale. What kind of 1:6 scale miniatures do you make? What are some challenges with creating accurately scaled miniatures? What do you like about it? For my personal collection I make whatever intrigues me at the moment. 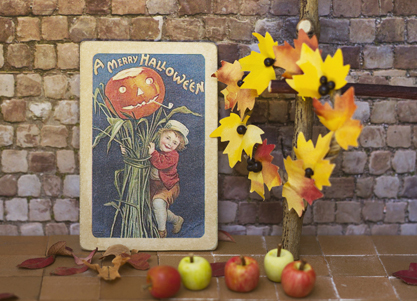 It usually begins with the idea for a photography and then I make all the props that I need. I’m often inspired by the season: I’ve made a spring gardening scene, some navy inspired miniatures, several Christmas related. However I don’t make everything by myself, there are some materials that I’m not familiar with, like ceramics and metal. I buy those if I need something like that. I work mostly with paper, balsa wood and polymer clay. It can be a fiddly work to make something so tiny, but the most challenging part for me is to achieve just the right colors and textures to make it look realistic. But It’s really satisfying when hours and hours of working pay with a good result. But many of these miniatures are too fragile to be shipped (or at least I’m worrying about it), so I sell only those sturdy enough and preferably flat. What has been some of your favourite pieces that you have made? Did you keep them or sell them? 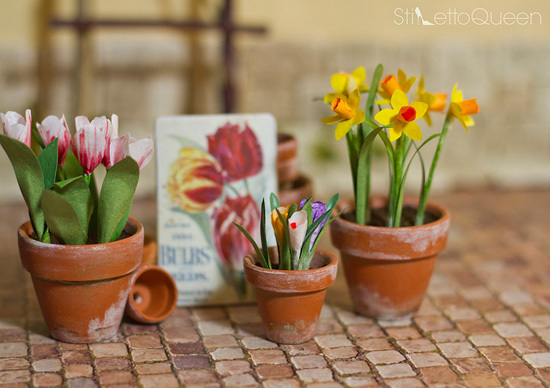 I love plants and miniature versions of them seems like obvious choice. They are made from paper, each petal or leaf hand painted and individually cut. It took so many hours to make them, they would be too expensive to sell. But I would love to add some plants to my shop and I’m working on more affordable options. As for the clothes – I hardly choose a favorite one and I don’t have a problem to let them go. I’m glad if people like them and dress their dolls in them. But my favorite item is always my next project – the one that is still in my head or in my sketchbook. What kind of routine do you have for working on your shop? Tell us about how your day is like. My Etsy shop doesn’t pay my bills (yet) so my working priority is my graphic design job. But working as a freelancer gives me enough flexibility to dedicate few hours a week to my shop, too. If I have an order, I pack the items in the evening and go to the post office next morning. My shop related activities depend mostly on lighting condition – I only use natural light for photographs and I prefer sewing at day time. I usually knit in the evening (in front of TV). Evening and late night hours are also reserved for computer work – photo editing, listing new items, searching for supplies. When making miniatures I don’t have a typical routine. I make them whenever I feel inspired. 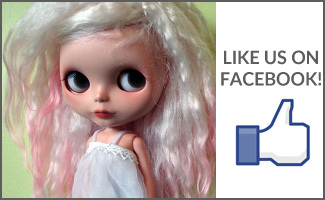 With so many other Etsy shops out there selling Blythe clothing and miniatures, how do you make yourself stand out? I never had any kind of marketing plan how to be distinctive from my competition. Maybe it’s the combination of clothes and miniatures – usually the shops specialize in either one or another. I don’t have a signature design style but since I love knitting, all of my fashions include a knitted part (usually the top of the dress). However – making only knits would be to limiting for me – I like to combine fabric and yarns, different colors, different textures, tiny embellishments … it’s my favorite part of the process. 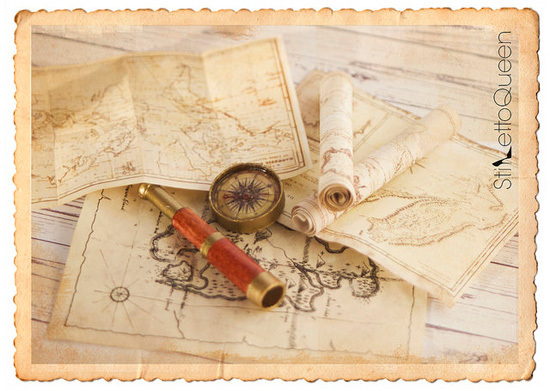 What would you say has been the most rewarding experience related to selling your work? The most heartwarming are the responses from my customers. I love to see their dolls wearing my clothes! As a doll lover myself I know the joy and excitement when a doll related parcel arrives to your post box, I try to imagine how would I feel if I was expecting a dolly mail so I put a lot of care and effort to pack my items nicely. Thank you so much for doing this interview with me, Andreja! What advice do you have for someone who’s thinking of opening their own online shop? Thank you for this wonderful opportunity, Michelle! As a relatively new seller I don’t have a lot of experience and trade tricks to share 🙂 The most important thing for me is to do what you love – believe in yourself and be patient. It might take some time till you make your first sale and then some more weeks till you make another … Don’t give up! Keep making new products and listing them. Etsy offers a lot of articles with tips and advices for sellers – they cover many topics from photography, finding the right tags, marketing tips … they are worth reading. But as I said – the most important thing is that you enjoy what you’re doing – it shows in your products and hopefully in sales too. You can find out more about Andreja on Flickr and Etsy. 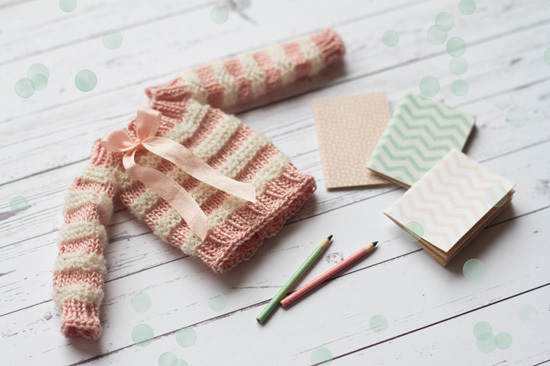 Andreja has generously decided to give away one Katjuss sweater with a set of notebooks to one lucky reader here on BlytheLife! The giveaway runs until Saturday March 12th 2016 at 11:59pm Pacific. The draw will be held on Sunday March 13th 2016 and the winner will be announced on BlytheLife.com. Remember to use a valid email address for all comments. If you win, your email will be forwarded to Andreja so she can get in contact with you regarding sending you the prize. It amazes me how talented you are! Such tiny details! I love miniatures, and I’m just getting into knitting ^^. That sweater and those teeny notebooks are adorable. It was a very interesting interview to read. The dresses are simply beautiful and those are some of the best and most realistic handmade miniatures I’ve ever seen. This was fabulous because I’m always curious how to make realistic knits and crochet for my girls and the work seen for this lovely artist was and is inspiring! I’m being introduced to new artists an people in the Blythe world, and it’s cute seeing knitwear that is so lifelike and not bulky! Very talented!! Tweets are for extra entries 🙂 It’s not necessary to tweet to enter! Those dresses are sooo cute and pretty! !Love the colour palette. I am discovering this little shop thanks to this post. I love all the clothes but it is the miniatures that took my breath away 🙂 those plants are precious ! That’s a very interesting interview (and an extra cute sweater 🙂 ), I love katjuss’s shop! This was a great article. I’ve been watching her shop on Etsy for some time. So many cute things. I’m hoping on my next Blythe spend I can get one of the cute dresses I’ve had my eyes on. I really love the detail on the knitted items. They look so pretty on the dolls and fit so nice. Amazing talent! Thank you for sharing!